The tutorial explains the uses of ROUND, ROUNDUP, ROUNDDOWN, FLOOR, CEILING, MROUND and other Excel rounding functions and provides formula examples to round decimal numbers to integers or to a certain number of decimal places, extract a fractional part, round to nearest 5, 10 or 100, and more. In some situations when you don't need an exact answer, rounding is a useful skill to use. In plain English, to round a number is to eliminate the least significant digits, making it simpler but keeping close to the original value. In other words, rounding lets you get an approximate number with the desired level of accuracy. In everyday life, rounding is commonly used to make numbers easier to estimate, communicate or work with. For instance, you can use rounding to make long decimal numbers shorter to report the results of complex calculations or round off currency values. Many different ways of rounding exist, such as rounding to integer, rounding to a specified increment, rounding to simple fractions, and so on. And Microsoft Excel provides a handful of functions to handle different rounding types. Below, you will find a quick overview of the major round functions and well as formula examples that demonstrate how to use those functions on the real-life data in your worksheets. How to round to nearest 5/10/100/1000 etc. Select the cell with the number(s) you want to round. Open the Format Cells dialog by pressing Ctrl + 1 or right click the cell(s) and choose Format Cells... from the context menu. In the Format Cells window, switch to either Number or Currency tab, and type the number of decimal places you want to display in the Decimal paces box. A preview of the rounded number will immediately show up under Sample. Click the OK button to save the changes and close the Format Cells dialog. Important note! This method changes the display format without changing the actual value stored in a cell. 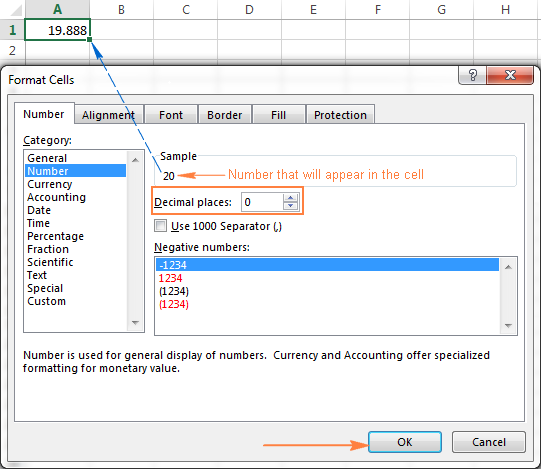 If you refer to that cell in any formulas, the original non-round value will be used in all calculations. Unlike formatting options that change only the display value, Excel round functions alter the actual value in a cell. Below you will find a list of functions specially designed for performing different types of rounding in Excel. ROUND is the major rounding function in Excel that rounds a numeric value to a specified number of digits. Number - any real number you want to round. This can be a number, reference to a cell containing the number or a formula-driven value. If num_digits is greater than 0, the number is rounded to the specified number of decimal places. For example =ROUND(15.55,1) rounds 15.55 to 15.6. If num_digits is less than 0, all decimal places are removed and the number is rounded to the left of the decimal point (to the nearest ten, hundred, thousand, etc.). For example =ROUND(15.55,-1) rounds 15.55 to the nearest 10 and returns 20 as the result. If num_digits equals 0, the number is rounded to the nearest integer (no decimal places). For example =ROUND(15.55,0) rounds 15.55 to 16. The Excel ROUND function follows the general math rules for rounding, where the number to the right of the rounding digit determines whether the number is rounded upwards or downwards. If the digit to the right of the rounding digit is 0, 1, 2, 3, or 4, the rounding digit is not changed, and the number is said to be rounded down. If the rounding digit is followed by 5, 6, 7, 8, or 9, the rounding digit is increased by one, and the number is rounded up. The ROUNDUP function rounds the number upward (away from 0) to a specified number of digits. Number - the number to be rounded up. Num_digits - the number of digits you want to round the number to. You can supply both positive and negative numbers in this argument, and it works like num_digits of the ROUND function discussed above, except that a number is always rounded upward. The ROUNDDOWN function in Excel does the opposite of what ROUNDUP does, i.e. rounds a number down, toward zero. Number - the number to be rounded down. Num_digits - the number of digits you want to round the number to. It works like the num_digits argument of the ROUND function, except that a number is always rounded downward. The following screenshot demonstrates the ROUNDDOWN function in action. 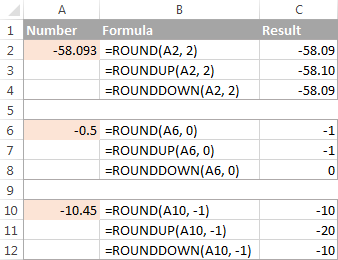 The MROUND function in Excel rounds a given number up or down to the specified multiple. Number - the value you want to round. Multiple - the multiple to which you want to round the number. For example, the formula =MROUND(7, 2) rounds 7 to the nearest multiple of 2 and returns 8 as the result. If the remainder is equal to or greater than half the value of the multiple argument, Excel MROUND rounds the last digit up. If the remainder is less than half the value of the multiple argument, the last digit is rounded down. The MROUND function comes in handy, say, for rounding prices to the nearest nickel (5 cents) or a dime (10 cents) to avoid dealing with pennies as change. Note. The MROUND function returns the #NUM! error when its arguments have different signs. For example, both of the formulas =MROUND(3, -2) and =MROUND(-5, 2) result in the NUM error. The FLOOR function in Excel is used to round a given number down, to the nearest multiple of a specified significance. Number - the number you want to round. Significance - the multiple to which you wish to round the number. For example, =FLOOR(2.5, 2) rounds 2.5 down to the nearest multiple of 2, which is 2. If the number and significance arguments are positive, the number is rounded down, toward zero, as in rows 2 and 10 in the screenshot below. If number is positive and significance is negative, the FLOOR function returns the #NUM error, as in row 4. If number is negative and significance is positive, the value is rounded down, away from zero, as in row 6. If number and significance are negative, the number is rounded up, toward zero, as in row 8. If number is an exact multiple of the significance argument, no rounding takes place. Note. In Excel 2003 & 2007, the number and significance arguments must have the same sign, either positive or negative, otherwise an error is returned. In newer Excel versions, the FLOOR function has been improved, so in Excel 2010, 2013 and 2016 it can handle a negative number and positive significance. 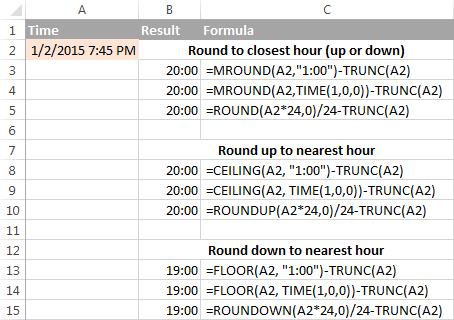 The CEILING function in Excel rounds a given number up, to the nearest multiple of significance. It has the same syntax as the FLOOR function. Significance - the multiple to which you want to round the number. For instance, the formula =CEILING(2.5, 2) rounds 2.5 up to the nearest multiple of 2, which is 4. The Excel CEILING function works based on the rounding rules similar to FLOOR's, except that it generally rounds up, away from 0. If both the number and significance arguments are positive, the number is rounded up, as in rows 2 and 10 in the screenshot below. If number is positive and significance is negative, the CEILING function returns the #NUM error, as in row 4. If number is negative and significance is positive, the value is rounded up, towards zero, as in row 6. If number and significance are negative, the value is rounded down, as in row 8. Of all Excel round functions, INT is probably the easiest one to use, because it requires only one argument. Number - the number you want to round down to the nearest integer. Positive numbers are rounded toward 0 while negative numbers are rounded away from 0. For example, =INT(1.5) returns 1 and =INT(-1.5) returns -2. The TRUNC function truncates a given numeric value to a specified number of decimal places. Number - any real number that you want to truncate. Num_digits - an optional argument that defines the precision of the truncation, i.e. the number of decimal places to truncate the number to. If omitted, the number is truncated to an integer (zero decimal places). If num_digits is positive, the number is truncated to the specified number of digits to the right of the decimal point. If num_digits is negative, the number is truncated to the specified number of digits to the left of the decimal point. If num_digits is 0 or omitted, it rounds the number to an integer. In this case, the TRUNC function works similarly to INT in that both return integers. However, TRUNC simply removes the factional part, while INT rounds a number down to the nearest integer.For example, =TRUNC(-2.4) returns -2, while =INT(-2.4) returns -3 because it's the lower integer. For more info, please see Rounding to integer example. These are two more functions provided by Excel for rounding a specified number to an integer. ODD(number) rounds up to the nearest odd integer. EVEN(number) rounds up to the nearest even integer. In both functions, number is any real number that you want to round. If number is non-numeric, the functions return the #VALUE! error. If number is negative, it is rounded away from zero. The ODD and EVEN functions may prove useful when you are processing items that come in pairs. As you see, there exist a variety of functions to round off numbers in Excel depending on the particular purpose. The following examples will hopefully give you some clues on how to use Excel rounding formulas based on your criteria. ROUNDUP function - always rounds the decimal upward. ROUNDDOWN function - always rounds the decimal downward. ROUND - rounds up if the rounding digit is followed by the digit equal to or greater than 5, otherwise rounds down. As an example, lets round the decimal numbers in column A to 2 decimal places. In the first argument (number), you enter a reference to the cell containing the number, and in the second argument (num_digits) you specify the number of decimal places you want to keep. =ROUNDUP(A2, 2) - rounds the number in A2 upward, to two decimal places. =ROUNDDOWN(A2, 2) - rounds the number in A2 downward, to two decimal places. =ROUND(A2, 2) - rounds the number in A2 to 2 decimal places, upward or downward, depending on whether the 3rd decimal digit is greater or less than 5. When the ROUNDUP function applies to negative numbers, they are said to be rounded up, even though they actually decrease in value. For example, the result of =ROUNDUP(-0.5, 0) is -1, as in row 7 in the screenshot below. The ROUNDDOWN function is known to round numbers downward, though negative numbers may increase in value. For example, the formula =ROUNDDOWN(-0.5, 0) returns 0, as in row 8 in the screenshot below. In fact, the rounding logic with regard to negative numbers is very simple. Whenever you use the ROUND, ROUNDDOWN or ROUNDUP function in Excel on a negative number, that number is first converted to its absolute value (without the minus sign), then the rounding operation occurs, and then the negative sign is re-applied to the result. If you want to extract a fractional part of a decimal number, you can use the TRUNC function to truncate the decimal places and then subtract that integer from the original decimal number. As is the case with rounding to a certain number of decimal places, there is a handful of functions for rounding a fractional number to an integer. To round up to nearest integer, use an Excel ROUNDUP formula with num_digits set to 0. For example =ROUNDUP(5.5, 0) rounds decimal 5.5 to 6. To remove the factional part without changing the integer part, use the TRUNC formula with the second argument (num_digits) omitted or set to 0. For example, =TRUNC(5.5) truncates the decimal part (.5) and returns the integer part (5). Microsoft Excel provides 3 functions that let you round numbers to nearest half, more precisely to the nearest multiple of 0.5. Which one to use depends on your rounding criteria. To round a number down to nearest 0.5, use the FLOOR function, for example =FLOOR(A2, 0.5). To round a number up to nearest 0.5, use the CEILING function, for example =CEILING(A2, 0.5). To round a number up or down to nearest 0.5, use the MROUND function, e.g. =MROUND(A2, 0.5). Whether MROUND rounds the number up or down depends on the remainder from dividing the number by multiple. If the remainder is equal to or greater than half the value of multiple, the number is rounded upward, otherwise downward. As you see, the MROUND function can be used for rounding positive values only, when applied to negative numbers, it returns the #NUM error. Rounding to nearest five, ten, hundred or thousand is done in the same manner as rounding to 0.5 discussed in the previous example. There may be many situations when you need to round time values. And again, you can use different rounding functions depending on your purpose. To round time to closest hour (up or down) - MROUND or ROUND. To round up time to nearest hour - ROUNDUP or CEILING. To round down time to nearest hour - ROUNDDOWN or FLOOR. In the ROUND, ROUNDUP and ROUNDDOWN formulas, you multiply the time value by 24 (number of hours in a day) to convert a serial number representing the time to hours. Then you use one of the rounding functions to round the decimal value to an integer, and then divide it by 24 to change the returned value back to the time format. Note. For the results to display correctly, remember to apply the Time format to your cells. 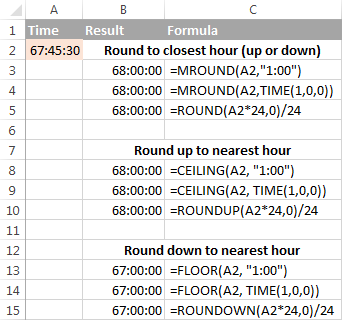 In case you want to round times in your Excel sheet to five or ten minutes, or to the closest quarter-hour, you can use the same rounding techniques as demonstrated above, but replace "1 hour" with the desired number of minutes in the formulas. If you know (or can calculate) what portion of a day is constituted by a certain number of minutes, then you won't have problems using the ROUND, ROUNDUP and ROUNDOWN functions as well. For example, knowing that 15 minutes, is 1/96th of a day, you can use one of the following formulas to round the time in A1 to the nearest quarter-hour. This is how you perform rounding in Excel. Hopefully, now you know how, among all those round functions, chose the one best suited for your needs. 111 Responses to "How to round numbers in Excel - ROUND, ROUNDUP, ROUNDDOWN and other functions"
I want to make grade of a exam result sheet. Grades will be if marks between 50 and 54, "C", Marks bet. 54 and 60, "B", bet. 60 and 100, "A". Please show How do I have to write the formula? If anyone can help me with the above formula. With the above the positive numbers are moved away from zero to the next whole number and negative numbers are also moved away from zero to the next whole number. The positive numbers are fine the fix I am looking for is when the negative numbers finish in -0.5 they get moved away from zero to the next whole number but I need them to go towards zero as shown in the examples below. CAN YOU HELP ME TO GET THE FOLLOWING RESULT? ANY FORMULA FOR THIS? Anybody can tells me. how i can count such below within a one Drag. Hi, Fedor, Can you help with my formula, which I think is similar to the problem above. I need to round my pricing so that the numbers end in either a 5 or a 9. The prices are whole numbers without decimals e.g $893. I need to round up to 2. If sum equals 2.07 round up to 3 etc.. If sum equals 2.07 round up to 3.00 etc..
Is there any way to set a rule in terms of when to round? For instance, at my job when we're billing by hand, we round anything 0.456 or above to 1 and anything 0.455 or below to 0. In Excel, however, I've tried several different ways to round according to the rules of my job with no luck. 0.456, even 0.5 most of the time, gets rounded down to 0. We create these number charts and most numbers round correctly but some numbers do fall victim to this discrepancy and I need to make sure we don't have errors because of this issue. What do you suggest? Hi, please can someone help. I need to round my pricing so that the numbers end in either a 5 or a 9. The prices are whole numbers without decimals e.g $893. Firstly great article very useful info on rounding. Now to my query is there a formula that will convert negative figures into positive figures with out affecting the value. The reason for this is I'm a bookkeeper and when i am downloading reports to excel to match to data downloaded from a CV file from bank. The debit side will sometimes show in a negative dependant on program its downloaded from, its makes it a nuisance when it in a negative as I have to add the figures together as one report will have positive figures and other report will have negative figure. When I would rather just do the usual (this-this=this), the outcome its to have the amount it equals to is 0. Then we know our reports match, & if it doesn't it then helps us find the out of balance amount. If we add further information to get a percentage or divided value, if the amount is in negative it gives an incorrect figure. Going through every figure and removing the - from the each amount takes up a lot of time, especially when the report is very long. This is time wasted when i could be making use of my time more efficiently. Hey - I wondered if you might help. I'm trying to work on membership rates and wanting to round down to $1,500 if the formula we use surpasses that mark. Any ideas people? Many thanks in advance. $887.65 to $887.64 leaving the even numbers as is. I can easily round up. I'm not finding a way to round down. Is there a way to force excel to round the following decimal down, instead of up? $2.225. I want it to round any number where the third decimal place is a "5" (and only a 5, not any other number) down, instead of up. can I round up years? for example 1 years, 3 months, 4 days, rounded up to 2 years. Could you give me the formulation? thanks. For the same input of 0.01, the spreadsheet should not be giving .02, .02 is incorrect. But why? Thanks. I am having a problem using ceiling function. Now my Problem is : I want to ceil few values upto 0.5 and then rest upto 0.25 in the SAME CELL !! like if i want to ceil values between 2 and 3 upto 0.5 i.e if i write 2.3 it gives me 2.5 or if i write 2.74 it gives me 3. But in the same cell if i write values between 0.5 to 2, it should ceil me upto 0.25 i.e. if i write 1.2 it should give me 1.25 or if i write 1.67 it should give me 1.75. Hoping for a reply. Thanks for the concern. In cell A1 have 10 and cell B1 is 8.50681, when I multiply A1*B1 result appear is "85.0681", But I show in Cell B1 is 8.50 till (2 decimal point). And now I want to multiply A1*B1, and I want that excel count till 2 decimal point like 8.50 in B1. Is it possible? remember B1 actual value is 8.50681.
anyone, greater than or equivalent to 16 days would be 10 months. I prematurely posted a significant digit rounding I've been using. Sediment is what I deal with and it is the size of clay in mm to cobble in mm, where significant digits count. I don't know of a function to do this so I wrote this formula; =ROUND(B1/10^TRUNC(LOG(B1)),A1-IF(B1>1,1,0))*10^TRUNC(LOG(B1)) with cell A1 the significant digits and B1 the input number to be rounded. Hi, Can hi you help me to get this? I'm needing to add 2 different percentages to a formula and they both need to round. I will need to round the first percentage before i can add the second percentage to that number. Right now excel will not allow me to round each percentage but will allow me to round both percentages at the end. Before, i needed to only add one percentage and the round formula works great but i cannot find a way to get it close. I have tried with a larger number, replace A3(218) with 1304 and the gap was larger and will cause problems. And in excel, with the same formula as above, i get 1418. I know with percentages you will have numbers be maybe 1 or 2 off due to rounding but this is too great and will not work. Please let me know if there is another way to write this formula to make it work properly. Hullo, I want to roundup cell I3 which carries an amount 2100 and I want to roundup the same as 3,000 in another cell and How can I do this task. Which formula used for the round in the multiple of 10 for both figure( Negative as well as positive). Mround is used only for the positive figure and rounddown is for negative figure but i want 1 formula for both the figure. I am needing to found any thing above 100 back down to 100. How do I write this formula? I may get 83.3333 but I need 83.125. Hello, I want to roundup cell 2564 =2560 and I want to roundup the 2564 =2570 in same cell and How can I do this task. Hello, how do i formulate a cell for the figures to end in a certain number (ex. 195, 295) and not in multiples of 95? Hey, does anyone know how I can round up or round down an equation? The 0 is for no decimal places. replace it with 2 for 2 decimal places or maybe with -1 to round to the nearest 10. Is there a way to round up an input in the same cell without adding a new column for the return result? eg, data validation? Thank you for the helpful information. I just wanted to point out that under the "TRUNC Function", in the screenshot example, the third row's formula should be "=TRUNC(A3,1)" in order to get the number in B3. Just don't want others to get confused. some cells may not contain a number value (common case as in "N/A"). Any thoughts whether it is possible to add validation as number prior to the round function, so that the formula does not return #VALUE!? Essentially, eliminate non-numeric values, before rounding each, and then summing. After a few moments of play, I believe this accomplishes what I want. Thank you for this site, which got me thinking about a solution. im having a problem on how to put "if the tenths digit number is ODD;roundup and if the tenths digit number is EVEN;rounddown" in excel formula. thanks in advance! Anyone can help me? for " positive number", it would be round up and for " negative number", it would be round down with "no". -15/9 rounddowwn -2 but i wanna see "no"
It was very useful to solve my requirement. Excel is an ocean we agree. Knowledge is all and it is worthy too. Thanks again for Svetlana Cheusheva and also other friends sharing your knowledge here. if y = 1,3,5,7,9 (odd) add 1 on y.
I am trying to round all of my numbers to three decimal places, and keep the zero at the end. For example, I want the number -0.0799488 to round to -0.080. When I use ROUND(cell,3), it rounds it to -0.08 (two decimals instead of three). Thank you. Try formatting the cells using this custom format: #,##0.000. Go to Format Cells, choose Custom option and enter this formatting in the field, save it and you're out. 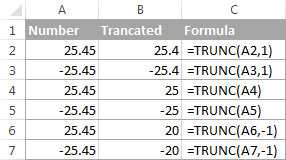 When I apply this formula, the cells that have added asterisks/plus signs do not keep the trailing zeroes. The cells that do not have added notation (the null values) DO keep the trailing zeroes. Custom formatting after the fact does not change the trailing zeroes issue for the ones that have had asterisks added. Working solution to this issue is to use the TEXT function with the ROUND function. This keeps the trailing zeroes and asterisks intact. Good evening!I'm needing to add IF formula in TRUNC calculated numerical digit. Everything is OK but when i input in G16 double numeric digit (example: 25.20) small bag condition its not work properly. please solve the problem. I want to know when I type 5. Cell automatically insert 5.5. I get time downloaded from a stopwatch in a hours:minutes:seconds:decimal seconds format. How do I round the seconds+decimal to just seconds e.g. 00:35:27.35782 to display as 00:35:27 ? If you want to display the time as 00:35:27 from 00:35:27.35782 select the cell holding the time and click on Format Cells then Custom the select the [h]:mm:ss option from the list and add another h in the square bracket. Click OK and that should display it the way you want. Hi, I am needing to write a formula that rounds to the nearest 0.5 however wont round to numbers that end in 2, 4.5, 7 & 9.5. -but 13.05 would round to 13.0 and 12.95 to 12.5. Thank you for your question, Vinay. To round time in Excel you can use the MROUND function. I am facing a problem while trying to use MROUND function for rounding off time. When I want to round up some amount of time say for example 172:24 to 172:30. Assuming that 172:24 lies in cell A!, I use the function MROUND(A1,"00:30"). I know that this function is perfectly alright. But when I input the said time amount in cell A1, it converts automatically to 04:24 and in the formula bar, it displays 07-01-1900 04:24:00. Obviously the I get wrong result of 04:30. Can you help me? I need getting many such sums of time - that is over time hours of our employees converted to next 30 minutes. I realized that I have made typo error in the following sentence. Assuming that 172:24 lies in cell A!, I use the function MROUND(A1,"00:30"). Assuming that 172:24 lies in cell A1, I use the function MROUND(A1,"00:30"). I have searched and cannot find an answer specific to my needs. Can anyone help, please? I want to write a formula that rounds anything from .1 up to the nearest integer, but anything below .1 (i.e. .07) round down to the nearest integer. So if I get 2.07, it becomes 2. But if it's 2.15 it becomes 3.
more, then round up to the nearest quarter hour. I want to always round up to the nearest $100. Hi, can anyone help please? I'm trying to round exam scores with 4 parts, so results will come in as, say, 5,8,5 and 7 out of ten (25/40) but I need to round the average of between 0.25 and 0.74 to a .5 score, and .75 to .24 score to a whole number. How do I make a fraction round up to the nearest fraction that i set? Anybody able to help pls? Do I need to combine two formulas together? Can u tell me , how can we remember all the formulas.